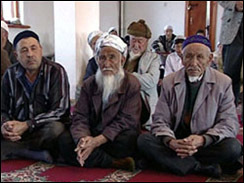 Native Kazakhs, a mix of Turkic and Mongol nomadic tribes who migrated into the region in the 13th century, were rarely united as a single nation. The area was conquered by Russia in the 18th century, and Kazakhstan became a Soviet Republic in 1936. During the 1950s and 1960s agricultural "Virgin Lands" program, Soviet citizens were encouraged to help cultivate Kazakhstan's northern pastures. This influx of immigrants (mostly Russians, but also some other deported nationalities) skewed the ethnic mixture and enabled non-Kazakhs to outnumber natives. Independence in 1991 caused many of these newcomers to emigrate. Kazakhstan's economy is larger than those of all the other Central Asian states combined, largely due to the country's vast natural resources and a recent history of political stability. Current issues include: developing a cohesive national identity; expanding the development of the country's vast energy resources and exporting them to world markets; achieving a sustainable economic growth; diversifying the economy outside the oil, gas, and mining sectors; enhancing Kazakhstan's competitiveness; and strengthening relations with neighboring states and other foreign powers. Kazakhstan, the largest of the former Soviet republics in territory, excluding Russia, possesses enormous fossil fuel reserves and plentiful supplies of other minerals and metals. It also has a large agricultural sector featuring livestock and grain. Kazakhstan's industrial sector rests on the extraction and processing of these natural resources and also on a growing machine-building sector specializing in construction equipment, tractors, agricultural machinery, and some defense items. The breakup of the USSR in December 1991 and the collapse in demand for Kazakhstan's traditional heavy industry products resulted in a short-term contraction of the economy, with the steepest annual decline occurring in 1994. In 1995-97, the pace of the government program of economic reform and privatization quickened, resulting in a substantial shifting of assets into the private sector. 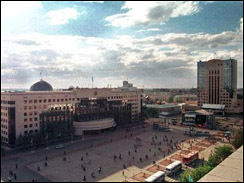 Kazakhstan enjoyed double-digit growth in 2000-01 - 8% or more per year in 2002-06 - thanks largely to its booming energy sector, but also to economic reform, good harvests, and foreign investment. The opening of the Caspian Consortium pipeline in 2001, from western Kazakhstan's Tengiz oilfield to the Black Sea, substantially raised export capacity. Kazakhstan in 2006 completed the Atasu-Alashankou portion of an oil pipeline to China that is planned to extend from the country's Caspian coast eastward to the Chinese border in future construction. The country has embarked upon an industrial policy designed to diversify the economy away from overdependence on the oil sector by developing light industry. The policy aims to reduce the influence of foreign investment and foreign personnel. The government has engaged in several disputes with foreign oil companies over the terms of production agreements; tensions continue. Upward pressure on the local currency continued in 2006 due to massive oil-related foreign-exchange inflows. Aided by strong growth and foreign exchange earnings, Kazakhstan aspires to become a regional financial center and has created a banking system comparable to those in Central Europe. Find out how a coup caused the breakup of one of the world's super powers. Meet the key players, view images of the coup and learn more about how the former Soviet republics are faring today.